I've used GMail since 2004, and would never consider going back to a world where I'm tied to an email program on one desktop computer. The main benefit of any webmail service is of course the ability to access your email anywhere, on any device. GMail's spam and malware filters are lightyears ahead of the competition. Its filing, search, and retrieval functions work intuitively and accurately. It’s online 99.9999% of the time, in my experience. I've written before about GMail basics, message filtering, addons, and how to add new features with GMail Labs. You can find those articles by visiting AskBobRankin.com and searching for "gmail" using the search box at the top of the page. Here are some additional GMail tricks most people don't know about. Customize your email address without changing it. Often times, you need to supply your email address when creating an online account, making a purchase, etc. By adding a plus sign and a tag to the end of your GMail address, you can keep track of who has shared your email with others. For example, when making a purchase at Kohls, you could enter janedoe+kohls@gmail.com on the order form. Messages sent to that address will still appear in the janedoe@gmail.com inbox. Similarly, when signing up for online newsletters, you could enter janedoe+news@gmail.com, and use a GMail filter to sweep all incoming newsletters to a special label (folder). Consolidate all of your email accounts under the GMail Webmail system. Yes, even Yahoo Mail, Hotmail or Outlook.com mail, AOL mail, and your company’s email such as yourname@yourcompany.com. All of your email from all of your accounts get the benefits of GMail’s filters, filing system, etc. Yet your company mail is still sent and received via your company’s email server, and copies can remain on that server as well as on GMail. When you want to send an email or reply to one, you can pick from a dropdown list which email account you wish to use. To add email accounts to your GMail account, click on the gear icon in the upper-right corner of any GMail page. 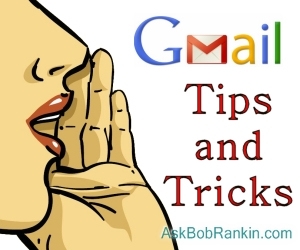 Select “Settings” and then “Accounts and Import.” In the section labeled, “Send mail as…” click on “Add another email address you own.” Follow the prompts, respond to the verification email that Google sends to the added address, and repeat as necessary. “Import mail and contacts” is the section just above “Send mail as…” It allows you to fetch all of your contacts and old mail stored on Yahoo, Hotmail, Outlook.com, AOL, and other Webmail servers. Once they are all in your GMail account, you can forget about the old servers unless you need to send or receive mail through them. Note that the importation process can take several days if you have lots of old mail on another email service. I touched on the existence of GMail Labs in the beginning of this article. But there are some cool optional features there that you can enable with a couple of clicks. If you are logged into your GMail account, click the gear icon, select “Settings” and then “Labs.” One of my favorites is "Quote selected text." That allows you to highlight a block of text in a message, and it will be quoted in the outgoing reply message. Without this feature, you have to manually trim all the unwanted text in your reply message. You can quickly enable any of the Labs options to try them out, or disable them if desired. I've been using Gmail for 12 years, and have 25 gigabytes of messages stored there. I've moved from one computer to another, and switched Internet service providers several times over those years. But my email has stayed constant, and GMail just keeps getting better. Do you use any of these GMail features? Do you have some GMail tips to share? Help, Spammers Hijacked my Email Account! Use Google Apps Without a Gmail Address? Is Google Reading Your Email? Time to Switch From Yahoo to Gmail? Was Your Email Account Hijacked? Should You Encrypt Your Email? What's Coming Next From Google? Most recent comments on "GMail Tricks You Probably Haven’t Tried"
You are highly respected with your audience, as you deserve to be. In the case of trusting your 25GB of stored messages in the brain-trust of google is literally and figuratively same as "putting all your eggs in one basket". Yet, your article puts little concern while fully endorsing a product. It is NOT like there are no other alternatives to doing the Borg-thing! A simple DuckDuckGo search for ‘gmail alternatives’ will lead to many other OpenSource ‘webmail clients’. Some of these offerings take user security and privacy a bit more seriously than google trolling for targetable ads in every bit of data that is routed through its servers. Sure, I got my gmail account in early "invite-only" days, where "Don't be evil" was the formal corporate motto. Yet, I value my security and privacy enough to NOT use the dominant player in the market for all my data. If security/privacy mean nil to all users, then the need for inventing the envelop would have been unnecessary! No? You mention security -- has there ever been a GMail security breach? With 2-factor authentication turned on, it doesn't even matter if a hacker somehow got your password. And running my own mail server? Among other things, I'd have to re-invent Google's amazing spam filter, and then I'd be back to 1995, accessing my mail with a desktop client. I love Gmail (my wife hates it), but I am not tied to it. I have several domain names I've purchased, and email to addresses at those domain names is automatically email-forwarded to my Gmail account. When I send emails from my Gmail account I use one of the alternate "FROM" addresses to match the domain name it's related to. And almost every night I use the MailStore Home program to archive the emails in my Gmail account onto my computer's hard disk. All of this means that I could switch to some other service instead of Gmail if I ever had to, and I wouldn't lose my email history nor have to notify anyone about changing my email address(s). I don't understand why I cannot change the sequenc e in a series of emails with the same person. The new stuff is always way down there, I like to have it on the top . Any suggestions ? I am writing in regard to your https link to the google blog. I read the article and then went on to the comment section. Of 36 comments, only one had anything to do with the blog entry. Most of them had to something to do with herpes and how they got rid of it. Either the article is (maybe?) bogus or google's blog itself has an awfully cruddy spam filter! Thank you and keep up the good work! I appreciate it! I totally agree with you about Gmail, and thanks a million for the tip on how to access spell-check. I had no idea it was there!!! Not to be off topic, but i noticed a few Yahoo email users commenting. I just read an article that claims Capitol Hill has banned Yahoo email because it is so insecure. I will stick with Gmail thanks. There's no such thing as a free lunch. Bob, this is a great subject for one of your e-books. You have published a lot of great information that should be consolidated into a single document. Thanks! You, sir, are a genius. I have long valued your contributions to sanity through this wonderful blog, and while it's generally from a silent but appreciative armchair on the sidelines, today I'm chiming in with a huge thanks. While I have used Thunderbird to consolidate my garden of emails for years (sometimes with great pain), I had no idea it was even an option with Gmail, which I prefer for all of the reasons you share here. I also had no idea you could do a handful of the other things you've pointed out, and remain grateful for the productivity boost this is going to offer. Thanks, Bob, so very much for the way you continue to make life so much easier in the generosity of your sharing! I have a Gmail account at my part-time job, and although I have used email for many years (including Outlook, Eudora, AOL, and Hotmail), I find Gmail not at all intuitive to use, and somewhat annoying. For example when composing a message. "Large" text looks good, but the text looks too large in the actual message. "Normal" looks good in the final message, but the type is small on my screen. Coho's frustration with message sequences annoys me as well. I don't have either a smart phone or a tablet, and I still don't trust "the Cloud". I am at my home computer a good part of the day, so I don't mind having an email account tied to my desktop computer. I can always check my ISP's server when I am traveling. With desktop-based email, I feel I don't have to worry as much about someone hacking my account, nor am I worried about losing my messages because I back my computer up regularly. As Gmail has evolved, so have I, and being able to use all of it across many different devices supported by Google, is an astounding creative tool for accessing the depth and breadth of our global civilization. Having Google store your mail is no different that using the myriad of cloud services. I'd rather not have my mail or other information floating in the cloud. I also don't like the new subscription, cloud operated programs and won't use them. I'm especially irritated with Adobe as I've been using their programs since '97 and now, to use something I've already spent thousands of dollars on, they insist that if I wish to continue using it I've got to subscribe to a cloud program. I am a huge Gmail fan, even after having used Hotmail and Yahoo, along with a few other free web mail services over the years. The single one feature of Gmail that puts it over the top, is that I have had no - that is ZERO - occasions when anyone reported having received spam from my Gmail addy. On the other hand, there is an old Yahoo account out there that I took measures to close, yet that did not happen as the thing still occasionally sends me and several of my old contacts spam messages. I would not hit a snake with Yahoo, or any Microsoft email service either. As far as the "intuitive" issue of Gmail, I agree that it does require some work to learn to employ the many super features. That said, the end result is well worth it. I know for a fact that it's possible, as I've had family members in their seventies and eighties learn to use it and love it! You really need the Google Chrome browser to use Gmail. I still have Win 7, and IE 11 does not handle Gmail well. I even open my Yahoo email program (which I use mostly for business) in Chrome. Love Gmail, especially if I must use someone else's computer. It handles Facebook well, too. Dear sir thank you for sharing such a nice information with us.Your article is very useful especially use of dot in our username. i think you have shared brilliant information with us. Your tips are very rare. I think, you have written this blog from your experience. That’s why your thinking is absolutely right for writing a super high content. I support your technique. Thanks for sharing this blog post. With this boosted post i have come up with my own Tricks on same i would love to share it with you https://goo.gl/cVYvrU I hope this can help all. One point - you say "use a GMail filter to sweep all incoming newsletters to a special label (folder)." Several years ago I was mentoring 'silver surfers' alongside another mentor. He didn't use gmail but was working with someone who did. He (rightly) pointed out that the less cluttered the inbox was the better. He created labels and labelled quite a few emails in the inbox. He then proceeded to DELETE the emails in the inbox. I overheard this and stopped him as quickly as I could. Although he didn't believe me when I said "Labels are *not* folders" he went to the labels and was unhappy (to say the least) when the emails he'd "copied" (as he thought) to the labels and then deleted from the inbox weren't there. Great article Bob. While I knew some of these tips and tricks, you always manage to unearth a number of things I hadn't come across anywhere else. Been using gMail since it first became available, as I too thought it's spam filter was a HUGE improvement over several other e-mail offerings, including HotMail and Comcast. By using POP3 settings and removing downloaded messages from the server, recent ones can still be accessed from my iPad Mini through Apple Mail, by using IMAP settings and going to the Trash folder. Messages sent from the iPad Mini are BCCd to myself, so when opening Windows Live Mail on my computer, I can have a permanent record of those too, by moving them into the local Sent folder. Yes, there are several other ways to accomplish the same thing, but this remains my time-tested favorite. I file important messages into folders and delete unnecessary stuff daily. Numerous times throughout the years, I've needed to verify information contained in messages. This allows me to access anything in moments, sent or received, over the last 16 years. There's more reader feedback... See all 37 comments for this article.